The high liquid volumetric capacity allows for smaller column diameter in new bespoke designs. 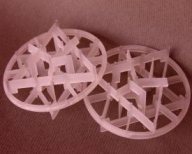 Moulded in virgin polypropylene and HDPE material. Also available in other engineering thermoplastics for critical applications. Thanks to its distinctive structure astaPAK is extraordinarily robust exhibiting unbeatable qualities of stability and resilience. When calculating the volume of the random packing to suit the volume of the packed bed of a tower, it is important to consider the wall effect & vertical compaction. A graph & formula for Pall Rings is given in the Pall Ring section of this website. 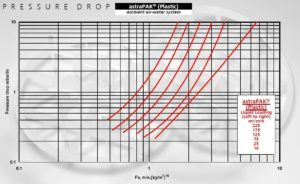 astraPAK being of an unusual design has different compaction rates depending the diameter of tower and how the tower is loaded and consolidated. Due to the diameter & design configuration of astraPAK it is not commonly used in towers with a diameter of less than 1000mm. 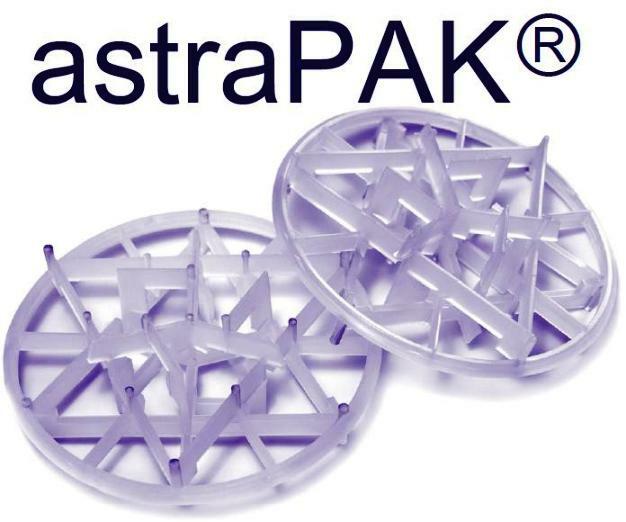 A portion of the astraPAK media will interlock during loading thus requiring more than the normal volume correction factor compared to Pall Rings. As a guide a minimum of 12% extra should be allowed. If the tower is large and is loaded with the maximum amount of compaction, figures between 15% – 18% to be considered. 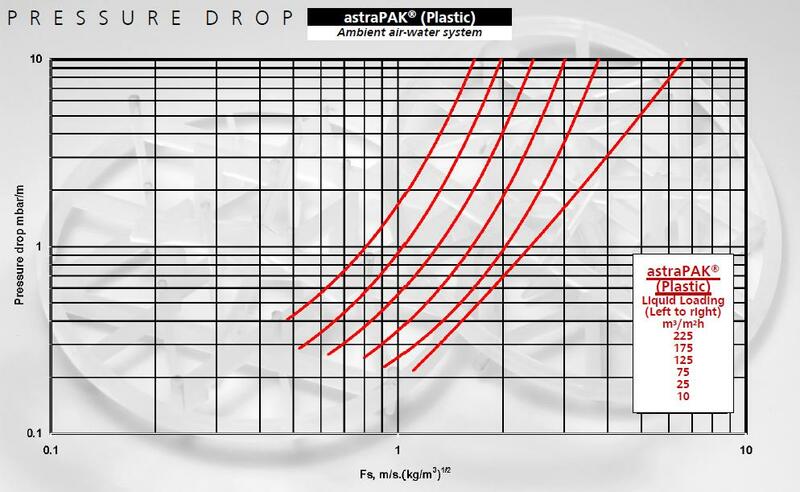 Your process design is normally calculated using the design data given for astraPAK which is based on one cubic metre bag of astraPAK containing 5000 units. If compaction takes place during & after loading and the depth of bed reduces slightly, theoretically the performance will not be affected as the Kga & hydraulic data are based on the number of units in a standard cubic metre.